The Commissioner is essentially limiting the degree of the Astro’s home field advantage by opening the roof. The Commissioner’s Office and MLB should not put itself in a position to even remotely influence the outcome of any game. Yes, but the roof was designed to allow play during bad weather. Plus, baseball is an outside sport, not at all meant to be played in a dome. You astro fans are reaching on this one. The Commish is right, here, in that he’s protecting the integrity of the game itself. The Sox were provided with the full benefit of their home field advantage; damp conditions, 45 degree temperatures, and the DH. The Astros should be afforded the same full benefits of their home field advantage; controlled conditions,full crowd noise, and no DH. There is no doubt that the closed roof provides a distinct home field advantage for the Astro players because of the fans. The Astro fans also have the right to experience the game in the conditions they prefer. After all, they paid enormous prices for the tickets to see the game and paid for the stadium the game is going to be played in. It seems to me the Astros should be able to do whatever they want so long as it’s fair. Back in the day, opposing clubs accused the Astros of altering the air-conditioning in the dome to enhance their own ball flight and hurt the opposing team. If this were the case, I’d say: “shut it down.” But fan noise is much more intangible. Also, the roof wasn’t really designed for “bad weather” only—it was designed also to keep the heat out…heat in Houston is good weather! I gotta say you are wrong on this one. I am so mad at Selig and MLB. Every home team has their unique qualities which are designed to make it hard to be a visiting team. The Red Sox, with their Green Monster, The White Sox, with there cold weather, and the Astros, with the Crawford Boxes and the indoor possibilities which create an intimidating atmosphere for the visiting team. I can’t help but think that since Selig is doing this to the Astros, then he should go ahead and figure out a way to “warm up the temp.” at UScellular…its only fair? The white sox are used to that weather in sept. and october. That is CLEARLY an advantage for them. The roof should be an Astros decision. It apparently wasn’t a problem in the Wild card series or NLCS. And why does MLB have the decision as to who sings the National Anthem? We should be able to select a Houston singer like Clint Black, if we so desire. I guess if a record company has enough money to push their artist… hmmm… just like payola in 50’s radio. Hopefully MLB isn’t pulling for the Sox as the ESPN announcers seem to be doing. Regardless of all that, I’m really proud of the character of the Astros players, the management, the fans and Houston. The Astro organization cannot speak out against MLB on the decision about the roof, but the fans sure can. The fans need to send a message to MLB and thake their stadium back. For those fans lucky enough to have tickets, a chant of “Close the Roof” before the National Anthem from 40,000 plus people should provide a spark for the team and at the same time send a message to Selig. I personally would not mind seeing the chant continue until the roof is closed. Good to hear Brad. The faithful at home are counting on the ticket holders. Hopefully more ticket holders are monitoring the blogs today. Since the Astros are in the National League, and the NL being the senior circuit, the American League should have to play by our rules. The DH has no place in baseball whatsoever. One of the first rules in basebal is that in order to play defense, you also have to bat in order to stay in the game. I think all NL clubs should press MLB to finally get rid of a rule initially designed to create more scoring. We have scoring and the good stragedy that goes along with making pitching changes. As far as our stadium design, and how it’s to be implemented, fair weather or not, is totally up to the team and our fans. It’s becoming clear that MLB this year, as in last year, wants to get monkeys off of some AL clubs. What happens with the roof IS the Astros’ call during the regular season, but NOT during the post-season. Period. All clubs know and agree beforehand — every single year — that the playoff games are MLB productions and MLB sets the dates, times and other details. MLB wants the Astros to do what they do during the regular season — and nothing else. Since the Astros open the roof when it’s below 80 degrees, they have to do it during the playoffs as well. Can’t change your policy when you get to the show! There is NO double standard here: MLB made Arizona open it’s roof, even though the Diamondbacks wanted it closed. ‘Nuff said! As for the DH rule, good luck convincing the players’ union to agree to let go of 14 highly paid jobs for veteran sluggers. Like that’s gonnna happen! Why was it closed during the NLDS, and the NLCS? MLB and Fox wants the Sox to win. PERIOD!!!! Otherwise why is it a big deal now? We have to get the word out to start the chant “Close the Roof” and take it out of MLB’s hands. Most of the NLDS and NLCS games at the Box were afternoon games, when the roof is always closed. Besides, the WS is a whole different ball game (pun intended). MLB and Fox use it as a showcase…which means the best possible visuals (it is TV, after all)…which means blimp shots of the park and the crowd for night games. Besides, since you’re all going to going without your socks, it’ll stink to high heaven in there with the roof closed. Yikes! Is it fair that the Astros had to play in 45degree weather while it rained? The Umpires could have called the game but they didn’t. The Sox have the exact same advantage that the Astros have with the roof open or closed as evidenced by the number of homers hit by opposing teams. 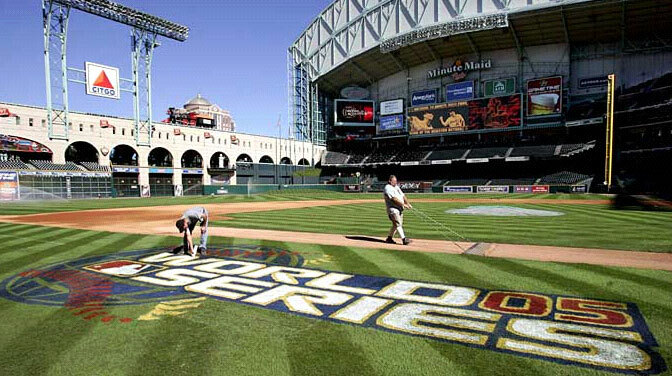 Houstonians paid and to have a covered ball field, NOT MLB or White Sox fans. MLB also approved the covered stadium. Now is not the time to change the rules. Let the Astros choose if the roof is open or closed. If the Sox are the team they claim they are, it doesn’t matter if the roof is open or closed. Its not if the roof is open or closed it is how each team plays. I’m a White Sox fan, and want to say that I’m disgusted about one of our fans harassing Craig Biggio’s wife during Game 2. For most of us on either side, we’re interested in watching baseball and hopefully enjoying wins by our team. People who act like idiots are unfortunately found in any city. I’m embarrassed that it happened in my team’s park. Sure you paid for the roof, and sure the White Sox should have no say in whether you close it or not. But MLB should. Why? ‘Cause MLB runs the World Series — period. There are lots of things MLB does during the playoffs that they don’t do during the regular season. Like take thousands of tickets that might have been bought by loyal fans, and distribute them to TV stars and corporate sponsors. Who cares about the roof? It doesn’t matter. I understand that Astros’ fans need any perceived advantage they can get, but the suggestion that Fox and MLB are pulling for the Sox by leaving the roof open is ridiculous. Open or closed, rain ir shine, cold or hot…JUST PLAY BALL! Let me guess…the White Sox only scored 5 runs in one inning off of Oswalt because the roof was open? I am not trying to be a jerk here but do not stress yourself out over things that you cannot control…you will drive yourself nuts. I am a Sox fan through and through but I was born and raised a sports fan in Buffalo, NY, the unofficial “Its not our fault we lost to a much better team than us” capital of the sporting world. Maybe you remeber the “wide right” fiasco, of the “no goal” that won the stanley cup playoffs, maybe even the illegal forward pass that was called a lateral to knock the Bills out of the playoffs. If the Astros lose to the Sox its because they were just beaten by good hitting, pitching and luck. If the Sox lose this World Series to Houston, then we Chicagoans have nothing to hang our heads over. We would have been beaten by a team that just plainly outplayed ours, roof or no roof. 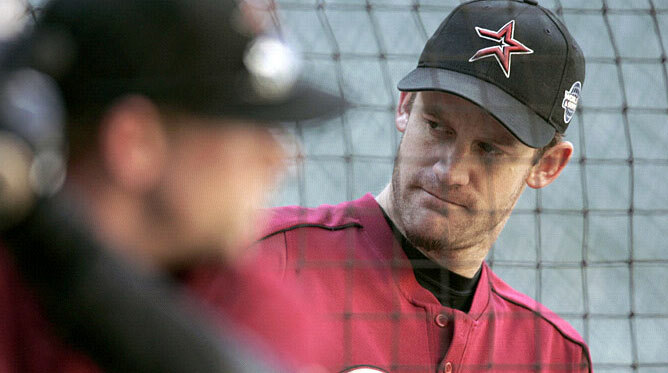 One last thing, as one of the alleged “lower class” fans that inhabit Sox Park (the real name for what non-chicagoans call the cell)I do not condone the behavior of the clown that smacked Biggio’s wife. I never knew that working 60 hours a week to pay my way through architecture school made me lower class, but to each their own. The soutsiders who frequent Sox Park are in no way “second class or lower class citizens” in comparison to the **** on the northside. Has anyone ever been to a wrigley field game? ….eeeeee-yuuuuuuuuuu…I wanted to rush home and take a shower….the ballpark (wrigley) is a joke even by minor league standards and the fans are just gross…but, I have to keep telling myself: it’s the Cubs, it’s the Cubs. And while today’s argument is about a retracting roof, imagine the dub, er Cub fans incomprehension of it all: it wasnt ’til 1988 that they put up lights in their joke park….way to go dubbies!!! Hi Jim i wish The Astros would at least win one World Series game. My heart Broke last night.One the Astros lost. 2 Geoff Blum beat the Astros and i still happen to like Geoff.See Ya next year at the new Busch Stadium in St. Louis. Go Astros. Can someone define home field advantage? Closing the roof would not be an unfair advantage, but opening the roof created a favor toward Bud Selig’s pal Reinsdorf. The best possible scenario for MLB would have been a Houston Sweep at home, thus forcing 7 games. Because of the statistics, there is a 70% probablity that the Astros are favored with the roof closed. Thus favoring the possibility of a Houston Sweep. To take that away was justified in terms of fairness. This took away the concept of what homefield advantage is all about. To compare this to purposely changing field conditions (i.e watering down a field or changing field conditions to favor the home team) is a complete misrepresentation by the AL loving Selig. In his recent interview, he alluded to how the two sweeps (last year by the Red Sox and this year by the White Sox) were good for baseball. A seven game series would have been better, yet he made a decision that favored a sweep. By the way Bud, if complete fairness is what is desired, then hold it at a neutral site and take away home field advantage all together. Of course I do not agree with this approach either. Bud, you really messed this one up! Bud Selig and MLB need to be looked at real hard. That would be be a bigger scandle than Joe Jackson. The commissioner fixing the outcome of the games. Did he not do that when he ordered the roof open in Houston. He did not seem to mind when St Louis was in town. It didn’t matter to him, since ST Louis was not his team. It almost looks as though the ALCS and the Series were scripted so the White Sox could win. Do you blame the umpires for the bad calls if that’s what the boss wants. Talk about a fix. Look at all the facts and how the games played out. Since MLB can dictate when the roof is opend or closed, then Harris County, and the City of Houston should sue MLB for the cost of the roof.